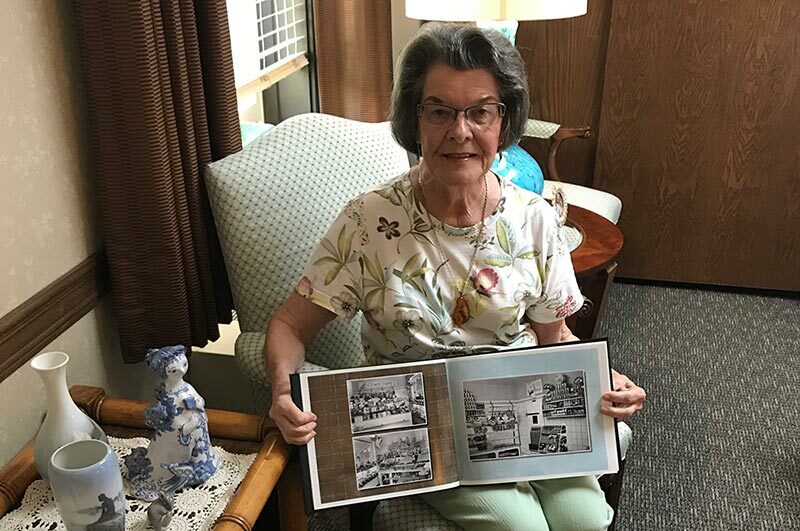 Seated in her new apartment, surrounded by Danish collectibles, Elaine Jensen displays a photo book of her late husband’s famous smoke house business. She came directly from Hawaii, where she lived for 30 years, but Elaine Jensen is very excited to start her “new adventure” at The Danish Home of Chicago. “Life is what you make it,” said the fit 75-year-old, who was still sporting tropical attire. Treated to champagne in first class accommodations, Elaine flew by herself from the Kona district of Hawaii’s Big Island and moved into The Danish Home on October 2. After running a water sports business (one of several island enterprises) with her husband Ole, who passed away in March, she was ready to test new waters in the Danish senior living community she’s known all her life. Her mother, Louise Blumenthal, was a resident of The Danish Home from 1998 until she passed away in 2002, and Ole catered sausage from his famous, long-standing Jensen’s Smoke House in Glenview for the home’s special occasions. Born in Fuglebjerg, Denmark, and a sausage business owner in the Danish town of Ringsted, Ole immigrated to the Chicago area in the early 1960s. “Ole always had to be something. After I retired, I wanted to do something, too,” said Elaine, who is still running her family’s rental home business in Hawaii, along with her daughter as property manager. “Ole always said, ‘Do it, then learn it.’” After the 26-year-old smoke house business closed, the couple moved to Hawaii, where they had vacationed many times and fell in love. Life in Hawaii included ventures in real estate (”my husband had a hobby of real estate built into him,” said Elaine), renting out snorkeling and kayak equipment, and dabbling in antique furniture and collectibles – often simultaneously. “We were a team; we worked 365 days a year and wore many hats, but we loved it. I learned a lot from that sausage maker. He was a genius!” said Elaine. According to Elaine, when her mother became a resident of The Danish Home, the Jensen family became even more entrenched in the community. When asked if she’ll miss the warm Hawaiian weather, Elaine asserted that she’s “let Chicago welcome me back” and is excited for the snow she hasn’t seen in years.